Image of an X2 from aviationweek.com. Steve Weiner joined Sikorsky in 1978 as a Flight Test engineer on the S-76 certification program. After joining Sikorsky?s Aerodynamics group in 1980, he was responsible for the aerodynamic performance of the S-75 ACAP. In 1981 he was assigned to the New Product Development group as the resident aerodynamics engineer, where he was part of the team that developed the LHX. Weiner was the System Engineer for the S-76 Fantail Demonstrator development team, which was instrumental in helping Sikorsky win the RAH-66 program. Weiner supported the RAH-66 Comanche program for 19 years, initially as Aerodynamicist and later as Technology Manager. In 2001, he was asked to form the Chief System Engineer?s group. In 2003, Weiner helped form and lead the New Concepts group in the development of the X2 Technology Demonstrator and related concepts. 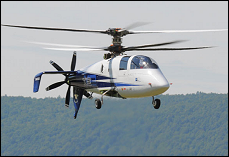 Weiner has been a primary proponent of X2 Technology as a key to expanding Sikorsky?s technological leadership in the rotorcraft industry and as a means to develop new engineering talent. He has been the technical lead of the program since its inception. In 2005, Weiner was also appointed Director of Engineering Sciences, with responsibility for the primary aeromechanics, mass properties and observables attributes of Sikorsky?s current and future products. Kevin L. Bredenbeck is Director of Flight Operations and Chief Test Pilot for Sikorsky Aircraft. Kevin is responsible for the global oversight and operations of the Sikorsky Flight Office, and Flight Operations. Kevin?s charter is to provide the leadership and oversight ensuring that Sikorsky continues its outstanding flight test development safety record across global operations, including definition and implementation of processes and procedures that guarantee that success.